St. Martin's Griffin, 9780312550660, 216pp. Most families with a member with celiac disease struggle to get food on the table that the whole family can enjoy. This easy-to-use cookbook focuses on creating simple recipes that minimize stress from three experts in the field. Most of the dishes use ingredients that are easily found in supermarkets and don't require the exotic flours, expensive ingredients or complicated recipes found in other gluten-free cookbooks. Here is a book that lives up to the promise of making real food for real people--real easy! 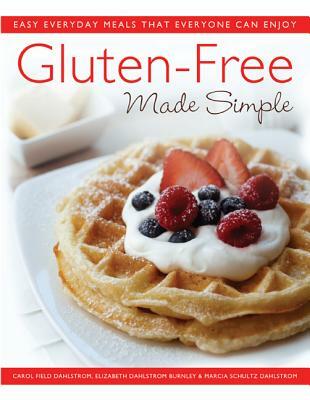 With over 100 delicious and easy-to-make gluten-free recipes for every meal of the day from entrees, soups, salads, and appetizers, to desserts and other baked goods. One of the fastest growing segments in nutrition is understanding the role of gluten and its effect on the immune system. This book offers guidance to people struggling to make sense of their food options and eat healthy while cooking delicious and appealing food for themselves and their families. Carol Field Dahlstrom was Executive Editor at Better Homes and Gardens books for many years. She is now president of her own company, Brave Ink Press. She became interested in developing gluten-free recipes when family members were diagnosed with Celiac disease. Elizabeth Dahlstrom Burnley has a M.S. and B.S. in Nutritional Science. She is currently a faculty member at Iowa State University, teaching food science and human nutrition courses, as well as a class on gluten-free cooking and baking. Marcia Schultz Dahlstrom has Celiac disease. Marcia has dedicated herself to developing gluten-free recipes that are easy and inexpensive and that she can prepare and enjoy with her family. “I have been eating gluten-free for two years but am not really a good cook. I live alone but now find that I really can’t go out to eat as easily as before. This cookbook is great---easy ingredients and great results. I actually like to cook now! The recipes in this book are real food and perfect for a guy like me.” ---Bill T.
“My husband just found out that he has celiac disease---he is 62. I have been scrambling to find some recipes that I can make that he will eat. Gluten-Free Made Simple saved the day! He loves the meals I am making him and the transition to gluten-free has been easier than I thought.” ---Betty T.